What Red Sox manager Bobby Valentine wants is what he now might be getting - competition. Valentine wants his starting rotation to fight in every inning of every game, with the message that if the pitchers do that they have the best chance to remain in the rotation when Daisuke Matsuzaka returns from his Tommy John surgery rehabilitation. That could be as soon as May 22, after Matsuzaka makes his next, and most likely last, rehab start for Pawtucket Thursday. The Sox could extend that one more start if Matsuzaka stumbles, because his rehab time doesn’t run out until May 23. But if he pitches well and is healthy, he will be in the major league rotation. While Valentine has gone with six-man rotations in Japan and also at times in his 16-year major league managerial career, he has indicated he likely won’t go to a six-man at all now, or if he does it will not be for very long. He seems to know what he’s going to do but he’s not telling a soul. It appears that Josh Beckett and Jon Lester, the top two starters, won’t be going anywhere. Valentine said he wouldn’t want the routines of established starters disrupted, believing that would cause more harm than good. He said if the older pitchers need more time for a physical issue or if the younger hurlers need to have their innings managed, a six-man rotation might be in play. But in saying that, he didn’t seem to think Daniel Bard fell into the second category, and he didn’t mention whether Felix Doubront did. 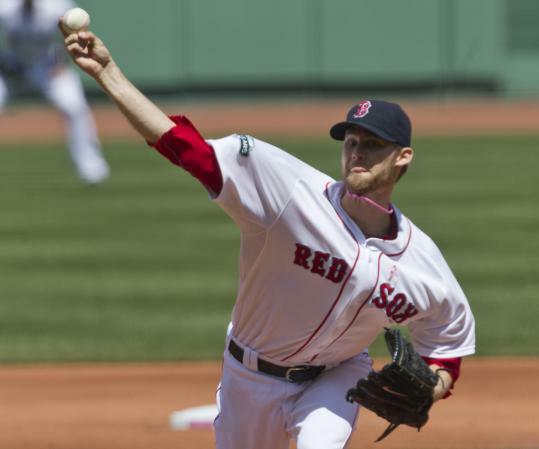 Given the financial commitment to Clay Buchholz and the fact that he pitched into the seventh inning Friday night, allowing three earned runs, Buchholz probably won’t be moving to the bullpen. That leaves Bard and Doubront. And if there’s a competition between the two for who survives and who goes back to the pen, it’s neck and neck. Doubront pitched well Saturday night and Bard did too in Sunday’s 12-1 win over Cleveland. Are they perfect? Far from it, but both are progressing into decent major league starters. Bard is finding out just how difficult it is to be a consistent winner. He’s 3-4 with a 4.30 ERA after pitching six innings Sunday, allowing one run on six hits with four walks and two strikeouts. Bard, who once had a 100 mile-per-hour fastball, was throwing 93-94 against the Indians and couldn’t get it over consistently. But what experienced pitchers do is find something that works and stick with it. Sunday, Bard found his breaking ball and changeup. When you’re a reliever, you can come in for that one or two innings and throw 98-100 m.p.h. and blow the fastball past everyone. What Bard has found as a starter is he needs to find a velocity with his fastball that allows him to command it. In some ways he’s turning into a finesse pitcher as he’s struck out only four batters in his last 18 1/3 innings after starting the season with 19 Ks in his first 18 2/3 innings. Bard, like Doubront, hasn’t had it all together in every start. What Bard is and what we thought he’d be are different at the moment. We thought he would have a great fastball capable of striking out a lot of hitters, but that hasn’t happened in his last four starts. But sometime between now and May 22, Valentine (and we think he will make the decision) will have to figure out what’s best for the team. Is Bard or Doubront more valuable in the rotation? Which of the two is better-suited for the bullpen? We know the answer to the bullpen part. It’s Bard. But it’s hard to come this far down the road with him as a starter and then send him back to his old job. And these are what teams call “good decisions’’ to have to make, and the Sox haven’t had many of those lately. Someone isn’t going to like the decision. We know Bard would hate going back to the pen. So the less messy decision is sending Doubront there. But do you want to disrupt his development? What we do know is that Matsuzaka won’t be working in relief. What’s been most alarming about Matsuzaka’s rehab outings is that his velocity hasn’t been much over 91 m.p.h. The Sox have had him throwing major league baseballs in the minors to reduce the threat of blisters. The minor league ball has more pronounced seams. Matsuzaka is a $10 million-a-year pitcher and this is his last hurrah in Boston. Valentine has been intrigued by him since he got here because of his experience facing him in Japan and his knowledge of Japanese pitchers and what makes them tick. He believes he can make a difference in Matsuzaka’s comfort level, his between-game routine. He hopes that comfort will translate into quality starts. Whatever happens, competition is what a team always shoots for. It tells you who wants it the most.